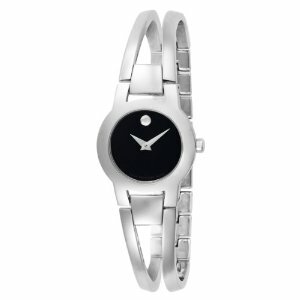 Movado watches have a reputation for quality and beauty. They are classy, sleek, and sophisticated. You will find that the Amorosa Stainless-Steel Bangle Bracelet Watch 604759 is also a piece you can add as a staple to your wardrobe that compliments many an outfit. You will find that youcan wear it everyday whether it is sweatshirt day, or a cocktail dress evening. The Women’s Amorosa watch has a Stainless Steel case and bangle bracelet. The dial is black Museum, which was created by Nathan George Horwitt in 1947 as the first artist to explore the concept of time as design. So not only is it a watch but a piece of traditional art going back more than half a century. The watch’s movement if of well trusted Swiss quartz. Bracelet: contemporary bangle which is sizable. The links can be removed for a custom fit. For a designer watch the price tag isn’t bad. On the manufacturer’s website it runs for $495, but a little birdy told me you can get it for much less on Amazon.com. The face of the watch can take quite the beating and remain utterly unmarked. Because the watch is so simple, it is a timepiece that won’t easily go out of fashion and will remain a classical timepiece through out the years. Wears like a comfortable bracelet. If you do not purchase this watch from the manufacturer’s website you won’t receive the warranty, and if it breaks jewelers will often say it needs to be repaired by an Authorized Movado Service. Telling the time on this watch takes some serious getting used to. Because the dial is solid black, with out numerals or markers of any kind besides the trademark dot at 12 o’clock, telling the exact time is a challenge. May steadily lose minutes (even with the battery changed) after several years of use. Variations to the Stainless Steel Amorosa include: Stainless Steel with two gold links, all gold instead of Stainless Steel, Stainless Steel with 18 diamonds spread out between two links, and Stainless Steel, plus two gold links, set with 9 diamonds in each, or a slight variation there of. Who is this watch for? 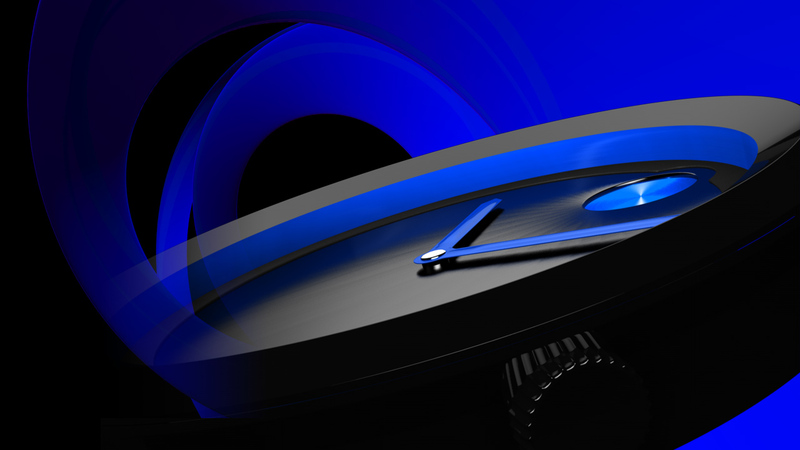 When looking at this watch I couldn’t help but think about its practicality as a timepiece. I had been looking at other watches with chronographs, subdials, and high water resistance. As a hard-core, time telling wrist watch, the Amorosa isn’t it. BUT if you are a woman or know a woman who likes her wrist adornment to be one part jewelry, one part art piece, and one part time- teller, than the Amorosa Stainless-Steel Bangle Bracelet may be just the item for you!